A new study led by researchers at the University of California, Berkeley, provides even more reason for people to read a book or do a puzzle, and to make such activities a lifetime habit. Brain scans revealed that people with no symptoms of Alzheimer’s who engaged in cognitively stimulating activities throughout their lives had fewer deposits of beta-amyloid, a destructive protein that is the hallmark of the disease. While previous research has suggested that engaging in mentally stimulating activities – such as reading, writing and playing games – may help stave off Alzheimer’s later in life, this new study identifies the biological target at play. This discovery could guide future research into effective prevention strategies. An estimated 5.4 million Americans live with Alzheimer’s disease, but the numbers are growing as baby boomers age. Between 2000 and 2008, deaths from Alzheimer’s increased 66 percent, making it the sixth-leading killer in the country. There is currently no cure, but a draft of the first-ever National Alzheimer’s Plan, released this week, revealed that the U.S. government is aiming for effective Alzheimer’s treatments by 2025. The new study, to be published Monday, Jan. 23, in the Archives of Neurology, puts the spotlight on amyloid – protein fibers folded into tangled plaques that accumulate in the brain. Beta-amyloid is considered the top suspect in the pathology of Alzheimer’s disease, so finding a way to reduce its development has become a major new direction of research. 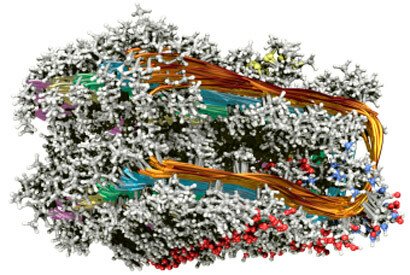 A molecular model of amyloid protein fibrils. Formed when mis-folded proteins self-assemble into fibrous sheet structures, they are found in the brains of sufferers of Alzheimer's disease. The researchers note that the buildup of amyloid can also be influenced by genes and aging – one-third of people age 60 and over have some amyloid deposits in their brain – but how much reading and writing one does is under each individual’s control. The researchers asked 65 healthy, cognitively normal adults aged 60 and over (average age was 76) to rate how frequently they participated in such mentally engaging activities as going to the library, reading books or newspapers, and writing letters or email. The questions focused on various points in life from age 6 to the present. 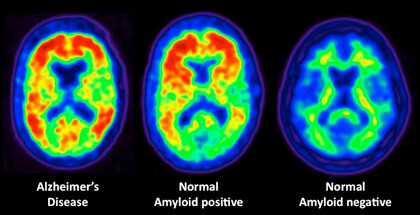 The participants took part in extensive neuropsychological testing to assess memory and other cognitive functions, and received positron emission tomography (PET) scans at the Berkeley Lab using a new tracer called Pittsburgh Compound B that was developed to visualize amyloid. The results of the brain scans of healthy older individuals with various levels of lifetime cognitive activity were compared with those of 10 patients diagnosed with Alzheimer’s disease and 11 healthy people in their 20s. The researchers found a significant association between higher levels of cognitive activity over a lifetime and lower levels of beta-amyloid in the PET scans. They analyzed the impact of other factors such as memory function, physical activity, self-rated memory ability, level of education and gender, and found that lifelong cognitive engagement was independently linked to amyloid deposition. Notably, the researchers did not find a strong connection between amyloid deposition and levels of current cognitive activity alone. “What our data suggests is that a whole lifetime of engaging in these activities has a bigger effect than being cognitively active just in older age,” said Landau. The researchers are careful to point out that the study does not negate the benefits of kicking up brain activity in later years. Other study authors include researchers from UC San Francisco’s Memory and Aging Center and Department of Neurology, and Rush University Medical Center’s Alzheimer’s Disease Center in Chicago. The National Institutes of Health and the Alzheimer’s Association helped support this research.